Land disputes between Bahrain and Qatar go back to the early 20th century. Tension between Qatar and its neighbors has been high lately, and now Bahrain says it can rightfully take Qatari land. Bahrain issued a press release Saturday saying it has the "right to claim what was cut off forcibly from its land." The country said it had given up many historic land rights to avoid conflict between the gulf states. Land disputes between Bahrain and Qatar occurred off and on for most of the 20th century. In 2001, the International Court of Justice split the disputed territories between the two countries. That seemed to have settled things for a while, but now, Bahrain wants all of what it claims to be its historical territory back — though the country hasn't stated whether it'll take any action. In June, seven countries cut diplomatic ties with Qatar, including Bahrain. They accused Qatar of supporting terrorist groups. Some of those countries also began blockading Qatar. 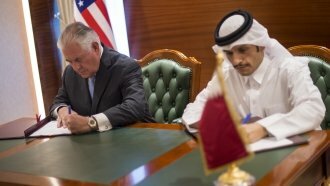 Four countries even issued a list of demands of Qatar, which Qatar said it would not accept.